In a fortnight’s time, Doctor Who will return to television for what looks to be a stunning new series on BBC One. Peter Capaldi’s Twelfth Doctor continues to prove full of surprises. 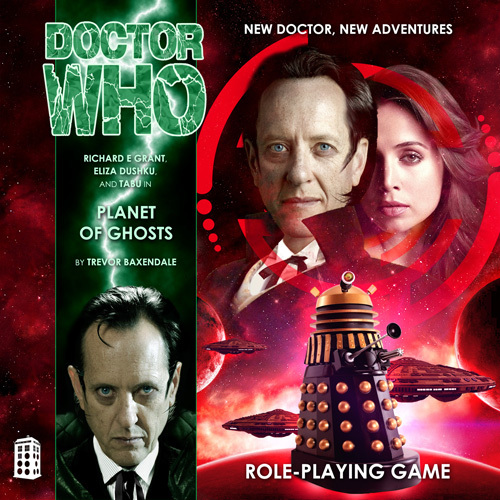 (And the new series is accompanied, of course, by a brand new edition of the Doctor Who Roleplaying Game released by Cubicle 7!) Shortly after the show’s return, our own tabletop version of Doctor Who will have its latest series premiere, although there are some changes in the cards for these dice-driven misadventures in time and space. After failing in his desperate effort to eliminate the corrupting influence of the Divinity from the timestream, incurring their wrath as well as the judgment of the Time Lords, the Doctor found himself face-to-face with with his mortal enemies once more in “Divine Retribution.” His greatest fears were rendered reality. The resulting confrontation precipitated a seemingly inevitable betrayal as Selene pledged her loyalty to the Master, earning the Doctor’s ire and nearly costing him the TARDIS. The decisive “Planet of Ghosts” ended on a somber note as Mohana bid farewell to her predecessor in the Doctor’s stead, leaving Selene frozen in cryogenic stasis, bound for Earth, unaware of her fate. When our campaign continues next month, we’ll fast-forward into a new era. One of the ways in which we hope to keep our campaign fresh is by regularly rotating roles. Each player will have the opportunity to serve as game master, and our campaign’s characters and mythology will sometime shift as a result. Soon a new game master will take charge, sharing a fresh take on these stories and introducing fresh player dynamics as well. The upcoming series of adventures will focus on the Doctor (Richard E Grant), the Master (Derek Jacobi), and Alison Cheney (Sophie Okonedo) as they travel through time and space, their destinies dictated by the mysterious mandate of the Time Lords. While the events of our first two series serve as a prelude to “Scream of the Shalka” (2003), our next few stories will take place after the events of the animated BBCi webcast. The Episodes page here on the blog outlines the order of adventures and campaign continuity and will always be up-to-date with the latest installment. If you’re looking for something to tide you over during the countdown to “The Magician’s Apprentice,” now is a fine time to pick up that copy of “Scream of the Shalka” on DVD. Spend an evening revisiting a memorable reinvention of our hero and have a glimpse at what might have been if the history of Doctor Who had jumped a time track and taken a different course. The story of that sophisticated, saturnine Doctor and his ominous trials and tribulations continues, right here, in the weeks to come. Continuity: The final adventure featuring Selene. Synopsis: As war rages with the Dalek Empire, the Galactic Union’s border worlds fall one-by-one. 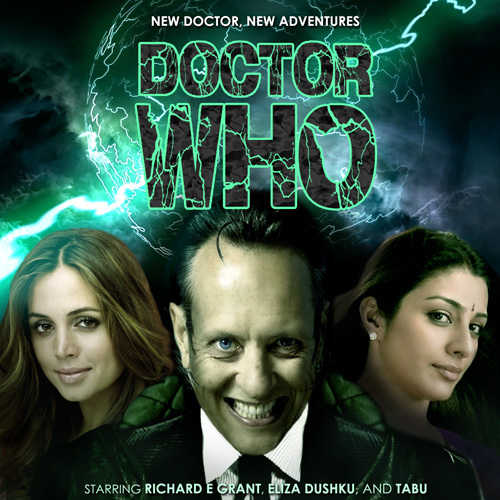 Rescued from a Dalek death trap by a motley band of bounty hunters, the Doctor, Selene, and Mohana witness the devastation of the fighting first hand as refugee fleets burn and whole planets are incinerated. A violent clash aboard the mercenary starship itself leaves Selene frozen in cryonic suspension, her life hanging in the balance, as the bounty hunters who saved her ruthlessly secure a captured Dalek. Though subjected to cruel torture, the mutant captive responds only to the voice of its most hated enemy: the Doctor. Dalek military movements in the sector, it reveals, centre around a single strategic point in space and time. Following this lead, the Doctor and companions both new and old soon find themselves deep beneath the surface of Arkheon, the fabled Planet of Ghosts, where the Daleks have begun construction on a device of staggering scope and power. If activated, it has the potential to alter the very timeline of the war. The Doctor and his allies must risk all in a desperate bid to free the prisoners of the Daleks and end their dangerous operations on Arkheon, or the human race will be exterminated once and for all.